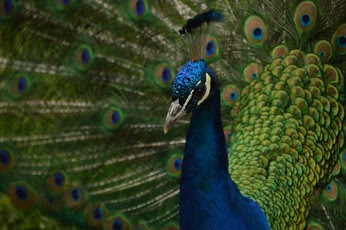 Introduction by Ted Kooser: Here David Wagoner, a distinguished poet living in Washington state, vividly describes a peacock courtship, and though it’s a poem about birds, haven’t you seen the males of other species, including ours, look every bit as puffed up, and observed the females’ hilarious indifference? The huge fan of his tail for her amazement. For his most fortunate audience: her alone. Stiff-legged under the great bulge of his breast. All these seeds spread just for her in the dirt. Reprinted from “Best of Prairie Schooner: Fiction and Poetry,” University of Nebraska Press, 2001, by permission of the author, whose most recent book is Good Morning and Good Night, University of Illinois Press, 2005. This weekly column is supported by The Poetry Foundation, The Library of Congress and the Department of English at the University of Nebraska, Lincoln. The column does not accept unsolicited poetry. Cheryl--I have to admit when I choose a poem I think about you, and whether or not you might have already read it! Sometimes the newer ones I know you've seen are too good to pass up, though. Glad you liked this one.